Johannsenite: Mineral information, data and localities. Named in 1932 by Waldemar Theodore Schaller in honor of Albert Johannsen [Belle Plaine, Iowa December 3, 1871 - January 11, 1962 Winter Park, Florida, USA], Professor and petrologist, University of Chicago, Chicago, Illinois, USA. Johannsen's contribution are noteworthy. He established quantitative definitions of rock analysis and rock classifications as well as redesigning the petrographic microscope. His five volume Petrography of the Igneous Rocks is a classic in petrography. 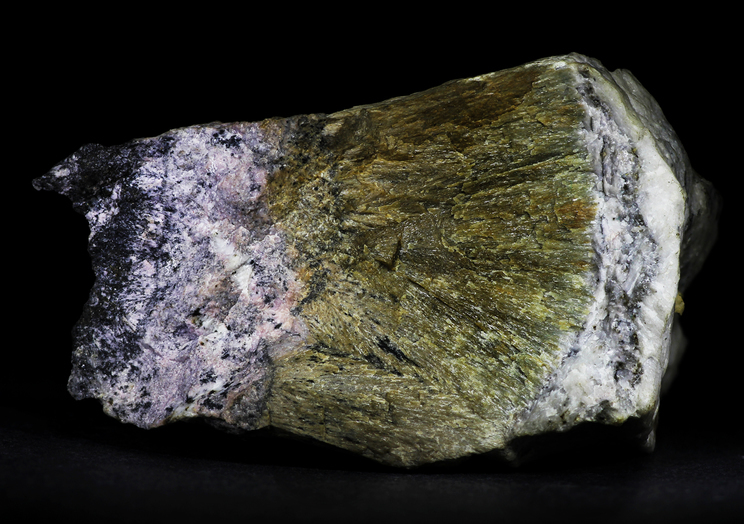 Pyroxene Group - Clinopyroxene Subgroup; see also Hedenbergite-Johannsenite Series, and the Diopside-Johannsenite Series. 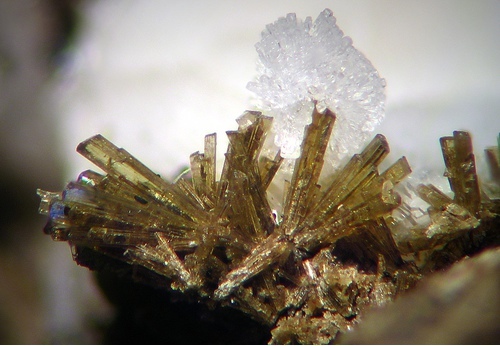 Ferrojohannsenite Iron(II)-bearing variety of johannsenite. Rhodonite 19 photos of Johannsenite associated with Rhodonite on mindat.org. Sphalerite 15 photos of Johannsenite associated with Sphalerite on mindat.org. Axinite-(Mn) 13 photos of Johannsenite associated with Axinite-(Mn) on mindat.org. Manganbabingtonite 12 photos of Johannsenite associated with Manganbabingtonite on mindat.org. Galena 9 photos of Johannsenite associated with Galena on mindat.org. Andradite 8 photos of Johannsenite associated with Andradite on mindat.org. Willemite 8 photos of Johannsenite associated with Willemite on mindat.org. Hendricksite 8 photos of Johannsenite associated with Hendricksite on mindat.org. Clinohedrite 8 photos of Johannsenite associated with Clinohedrite on mindat.org. Nekoite 6 photos of Johannsenite associated with Nekoite on mindat.org. 14.18.3 Zakharovite Na4Mn5Si10O24(OH)6 · 6H2O Trig. 14.18.5 Shafranovskite Na3K2(Mn,Fe,Na)4[Si9(O,OH)27](OH)2 · nH2O Trig. 14.18.15 Truscottite (Ca,Mn)14Si24O58(OH)8 · 2H2O Trig. 14.18.16 Santaclaraite CaMn4[Si5O14OH](OH) · H2O Tric. 14.18.20 Orlymanite Ca4Mn3Si8O20(OH)6 · 2H2O Hex. 14.18.22 Orientite Ca8Mn3+10(SiO4)3(Si3O10)3(OH)10 · 4H2O Orth. 14.18.24 Bostwickite CaMn6Si3O16 · 7H2O Orth. 14.18.25 Kittatinnyite Ca2Mn2Mn(SiO4)2(OH)4 · 9H2O Hex. 14.18.37 Neotocite (Mn,Fe,Mg)SiO3 · H2O Amor. Schaller, W.T. (1938) Johansennite, a new manganese pyroxene. American Mineralogist: 23: 575-582. Freed, R.L., Peacor, D.R. (1967) Refinement of the crystal structure of johansennite. American Mineralogist: 52 709-720. Clark, J.R., Appleman, D.E., Papike, J.J. (1969) Crystal-chemical characterization of clinopyroxenes based on eight new structure refinements. MSA Special Paper: 2: 31-50. Burt, D.M. and London, D. (1978) Manganbabingtonite and ilvaite from a hedenbergite-johannsenite skarn, Aravaipa, Arizona. Geol. Soc. Am., Abs. with Prog., 10/3, 98. Deer, W.A., Howie, R.A., Zussman, J. (1997) Rock-Forming Minerals. Volume 2A, Geological Society of London, 764pp., 294-398. Birch, W. D., ed. 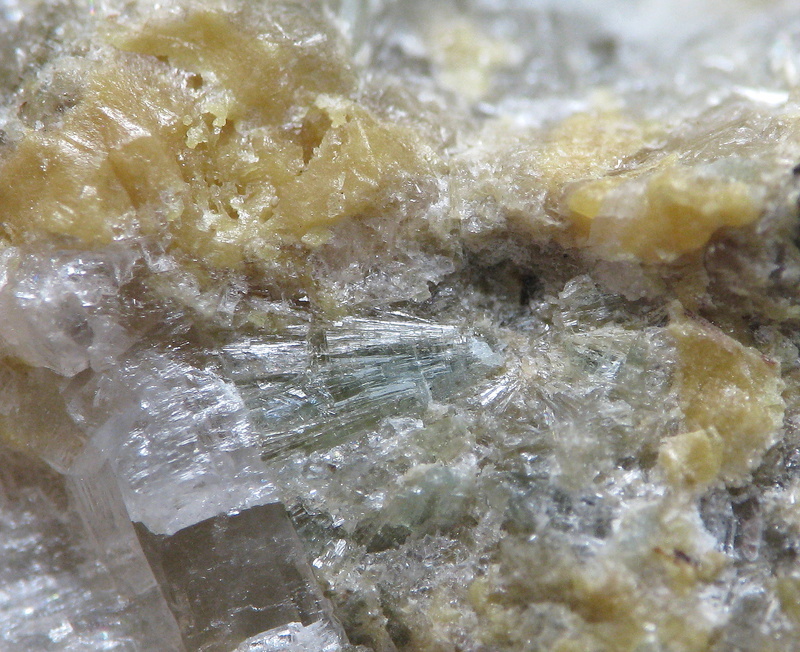 (1999): The minerals of Broken Hill. Broken Hill City Council and Museum of Victoria, Broken Hill, Australia, 289 pp. Vassileva, R. D., Atanassova, R., & Bonev, I. K. (2009). A review of the morphological varieties of ore bodies in the Madan Pb-Zn deposits, Central Rhodopes, Bulgaria. Geochem Mineral Petrol, 47, 31-49. Vassileva, R. D., & Василева, Р. Д. Compositional variation in the rhodonites from the metasomatic Pb-Zn deposits in Central Rhodopes Вариации в химичния състав на родонити от метасоматичните оловно-цинкови находища в Централните Родопи. Redazione (2005): Sistematica ligure: resoconto 2005. Notiziario di Mineralogia Ferrania Club, 19, 3-5. Bracco, R. and Balestra, C. (2014): La miniera di Monte Nero, Rocchetta Vara, La Spezia, Liguria: minerali classici e novità. Micro, 12, 1, 2-28. Ghizzoni, S. & Mazzoleni, G. (2005): Itinerari mineralogici in val Codera. Geologia Insubrica, Ed., Milano, 316 pp. Bertolani, M. (1976): Il giacimento manganesifero di Ravinella di Sotto presso Forno (Valle Strona di Omegna). "Giorgio Bortolozzi (visual identification)"; SEM-EDS analysis (AMI UK Service); Ferretti, P., Fassina, B. and Rocchetti, I. (2018) Il giacimento manganesifero della miniera Erla (Baselga di Pinè, TN). I minerali e il sito estrattivo. Rivista Mineralogica Italiana, 42, 4 (4-2018), 246-261. Dini A., Orlandi P., Vezzoni S. (2013): Temperino e Lanzi. Le paragenesi primarie dello skarn. Riv. Mineral. Ital., 37, 1 (1-2013), 28-39. -Boscardin M., Daleffe A., Rocchetti I., Zordan A. “I minerali nel Vicentino”, Museo “G. Zannato”, Montecchio Maggiore (Vicenza), 2011. Mineral.Journ.Japan (1985) 12, 341-348; Economic Geology 93 (1998) 303-325. H. Momoi (1964) Memoirs of the Faculty of Science, Kyushu University, Series D, Geology, 15, #1, 65-72. Matsueda, H. (1980) Journal of the Mining College, Akita University, Ser. A, Mining Geology, 5, #4, 15-77. PXRD by Alfredo Petrov, July 2016. A. Kato et al. , Bull. Minéral., 1981, 104, pp. 396-399, France. Akira Kato (2011) Reference informations on distributed specimens at the Ordinary Meeting of Mumeikai Group, No. 1 (April, 2011). Vlad, S.N. (1997): Mineralium Deposita 32, 446-451. A. I. Brusnitsyn, I. G. Zhukov, V. N. Kuleshov (2009): The Bikkulovskoe manganese deposit (South Urals): Geological setting, composition of metalliferous rocks, and formation model. Lithology and Mineral Resources 44, 557-578. Testard, J., Tegyey, M., Picot, P., Maury, M., & Kosakevitch, M. (1979, June). Khnaiguiyah: Mineralization in an Acid Volcanosedimentary Environment. In Evolution and Mineralization of the Arabian-Nubian Shield: Proceedings of a Symposium Convened (Vol. 3, p. 80). Pergamon Press. Anthony, J.W., et al (1995), Mineralogy of Arizona, 3rd.ed. : 312; Simons, F.S. 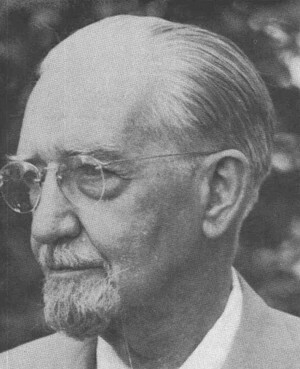 & E. Munson (1963), Johannsenite from the Aravaipa mining district, AZ, Am.Min. : 48: 1154-1158. Anthony, J.W., et al (1995), Mineralogy of Arizona, 3rd.ed. : 263; Simons, F.S. & E. Munson (1963), Johannsenite from the Aravaipa mining district, AZ, Am.Min. : 48: 1154-1158. Anthony, J.W., et al (1995), Mineralogy of Arizona, 3rd.ed. : 245; Reiter, B.E. (1981), Controls on lead-zinc skarn mineralization, Iron Cap mine area, Aravaipa district, Graham Co., AZ, in C. Stone and J.P. Jenney (editors), AZ Geol. Soc. Digest: 13: 117-125. Anthony, J.W., et al (1995), Mineralogy of Arizona, 3rd. ed. : 390, 401. Anthony, J.W., et al (1995), Mineralogy of Arizona, 3rd.ed. : 263.
ⓘ Jail Hill Road locality (Jail Hill Quarry) ? Schooner, Richard. (circa 1980s), Untitled manuscript on central Connecticut minerals. Schaller, W.T. : Am.Min. :23:575-582 (1938); Dunn(1995):Pt3:434-435.